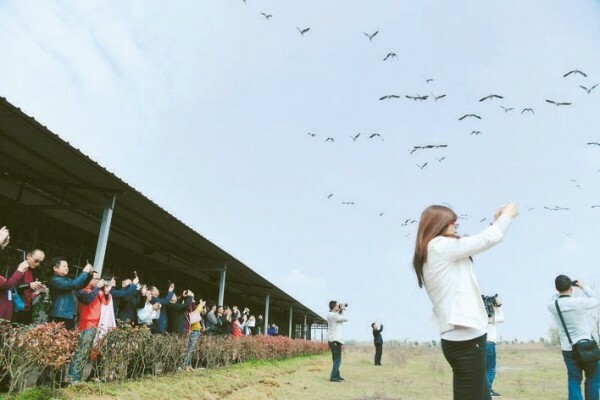 On April 1, the 2019 Hunan Bird-loving Week kicked off at East Lake National Wetland Park of Yangsha Lake International Tourist Resort, Xiangyin County. An action to ‘help birds fly’ was held simultaneously. Hundreds of swans and wild geese flocked together, making a beautiful picture of birds, waters, plants, and tourists. Hunan’s annual Bird-loving Week takes place between April 1 and 7. It was hosted by the Hunan Provincial Forestry Bureau, the Yueyang Municipal Forestry Bureau, the Xiangyin County People’s Government and the Hunan Wildlife Conservation Association. Themed “Focusing on Bird Migration and Maintaining a Life Community”, the event called on people to protect birds and other wild animals in various forms. It attracted nearly a thousand guests and tourists. In recent years, Xiangyin County has firmly adhered to the path that prioritizes ecology and highlights green development, and facilitated the development of the Yangtze Economic Belt by promoting well-coordinated environmental conservation and avoiding excessive development. Efforts have been made to increase publicity and education of related laws and regulations on bird protection, and strengthen bird protection and management at nature reserves, wetland parks, and forest parks. The ecological quality of the South Dongting Lake Wetland has been significantly improved, with 15,000 new migratory birds in 2018.